The Bureau of Standards, Metrology & Inspection (BSMI) cares about the aged and the physically & mentally disabled, and the accessibility in their daily lives and movements. The BSMI keeps promoting the protection of the rights of the physically & mentally disabled. Accordingly, it held the “Universal Design Competition of Assistive Device for Mentally & Physically Handicapped and Aged” and “Selection of Superior Commercial Friendly Assistive Device for Mentally & Physically Handicapped and Aged.” The two competitions received 143 entries and 83 entries respectively and the awards ceremony was held on November 5th, 2018. The event was held at the BSMI and chaired by the Deputy Director-General, Chung-Lin Wang. The ceremony was a huge success. The ingenuity and creativity of the participants will inject new energy into the assistive device industry of Taiwan. The BSMI stated that the focus of the universal design competition of the assistive products this year is on the usability of the product “for different user groups, environments and contexts.” That is, the competition and selection of this year features on creativity. A good assistive product is focused on the actual feeling of the users using the product. The industry is encouraged to put emphasis on the actual usage of the products by the aged and the physically & mentally disabled, and to improve the friendliness of the assistive product design. 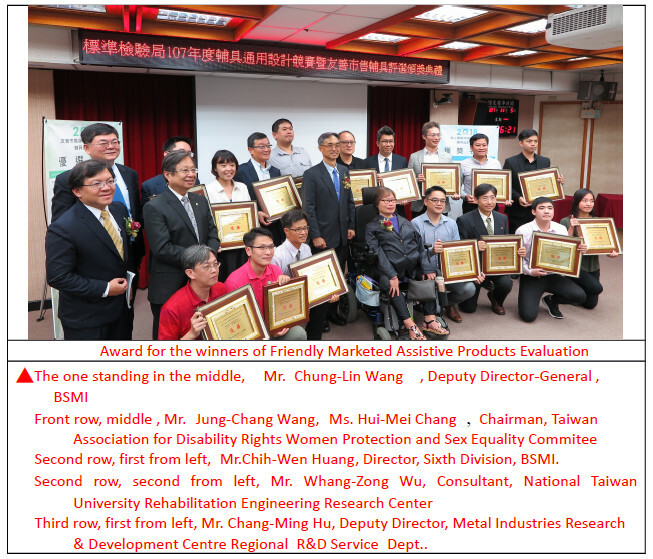 The BSMI hopes to promote domestic assistive products, universal design principles and product safety through this event, and to contribute to the development of the assistive industry in Taiwan. The BSMI pointed out that this year’s competition was very intense. There were 143 entries in the competition of the universal design, and each product had its excellent design concept. After a rigorous selection, the winners of the gold, silver and bronze medals were selected and they are “TAKE OFF”, “Smart Dietitian” and “FRIENDLY TABLE” respectively. In addition, the selection of superior commercial friendly assistive products for the physically & mentally disabled and the aged has covered a total of 83 products. Each product has been deliberately designed with safety and convenience features. Through the evaluation, the most outstanding 20 products were selected. The BSMI stressed that through the product design competition and the selection of superior commercial friendly assistive product, it encourages the participants to be creative and promotes the development of a friendly environment by applying innovations. It will encourage more research and development activities for assistive products and to continue to add progressive momentum into the development of the assistive industry in Taiwan.